I loveeee lebanese eggplants - bought some from Woolies a few days back. Yummay! I also happened to have some spring onion shoots and half an onion rolling around the vege compartment in my fridge. Perfect :) My mom never used spring onions in her version, but I figured that I might as well throw them in to add some colour and extra flavour to the dish. So about 30 minutes later (I'm still quite slow in the kitchen! ), my eggplant dish was finally ready. Taste test: It tasted pretty darn good! (Phew) I ate is with steamed rice, but it should taste pretty good with any type of bread or couscous as well. And it will be a really good side dish to be served with lamb curry (or lamb kebabs, or lamb anything!). Lamb and eggplant seem to go so well together! First, I soaked the sliced eggplant in a bowl of water with about 1 tablespoon of salt in it - this prevents the eggplant from discolouring and also makes the eggplants less bitter. I left it to soak for about 20 minutes while I sliced my onion, spring onions and garlic. Then I drained the water from the eggplant bowl and threw in the cumin, turmeric and chilli powder and gave the concoction a good mix to coat each piece as evenly as possible. Deep-fry the eggplant in batches (note: overcrowded wok = soggy eggplant) and set it aside - you know it's fried when it turns a golden brown. In a separate frying pan over a medium fire, with a teeny bit of oil, I fried the dried chilli and curry leaves till fragrant (about 30 seconds), then threw in the garlic and onion and fried them for 3-5 minutes until soft and just turning a nice golden colour. And then the best part - serve and EAT! Is the title too much of a fail at wordplay?? Well, it's going to have to do because I can't seem to think of anything better at this point in time. Meh. So Elceed opened just a few months ago, and I stumbled upon photos of its food on my Facebook newsfeed (I know what you're thinking - no, I wasn't stalking!). And it was put on my list of breakfast places to check out. Yes, I have a list for that. I also have a list for anything else that lists can be made for. I love lists. It makes my scattered and constantly confuddled mind a bit less so. So I did get a chance to check it out (hooray! ), and I loved it! This place, like Mixed Business, also has a cosy little backyard eating area with lots of potted plants and wooden tables and stools. It is more spacious than the backyard at Mixed Business, but has a similar vibe. I was really happy that we had the chance to sit there. The place was fairly quiet for a Saturday afternoon... which was a bit of a pity because it is a really nice cafe! So naturally, it should have more patrons... *hint hint*. The food was very good - well-presented (passes the initial "needs to look like something you'd actually want to eat" test), each dish had a very good mix of components that contrasted and balanced well with each other, and (most importantly) the flavours and cooking methods were well executed (e.g. the grilled haloumi, candied prosciutto, poached eggs). 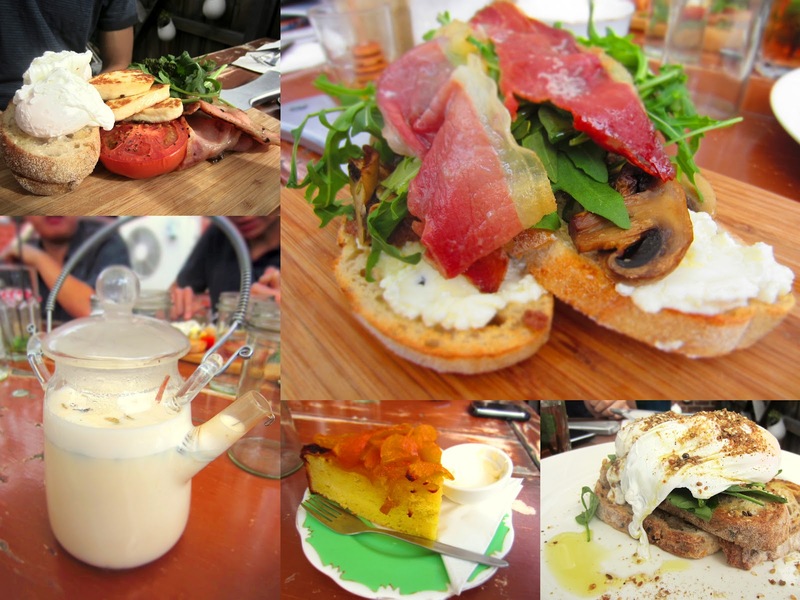 I had the Meredith goat's cheese with mushrooms, rocket and candied prosciutto on toast. This is a dish that I would highly recommend - that candied prosciutto - oh man. Delicate thin slices of prosciutto, candied to perfection with just the right amount of fat marbled through. It was practically singing out to me from the paddle it was served on (think Pavarotti singing Nessun Dorma). Every bite made a soft crunching sound, the texture of which contrasted so well with the creamy goat's cheese and the soft, juicy mushrooms. The other dishes sampled were the poached eggs (which JWT - the Matt Preston of poached eggs - pronounced to be perfectly poached) with spinach, yoghurt and dukkah on toast; the poached eggs with grilled haloumi and bacon on sourdough; and the upside down apricot and mandarin teacake served with clotted cream. I lurved the teacake - it was moist, and soft, the pieces of apricot and mandarin on top were sweet and tangy, and that clotted cream on the side was the cherry on top of the cake, so to speak. And of course, I ordered myself a chai latte. Seriously, I've been having random and uncontrolled cravings for chai latte over the past few days. Damn female hormones.. On that note, I'm not entirely convinced that this beverage should even be called a chai latte because it literally translates to be "tea milk" (chai means tea in Hindi, and latte means milk in Italian)... ?? And then there's the obvious fact that it's a term that is an amalgamation of 2 completely different languages. Catch my drift? I'm pretty sure that I actually squealed out loud in amusement and delight when my chai tea was served, not exactly because I was that excited about the tea (there's only so much you can do with the drink), but because the teapot that it was served in was sooo quirky!! It looked like something from a chemistry lab that had been modified to vaguely resemble a teapot - a beaker with a lid and a spout, little bits of coiled metal in it (to strain the tea), and a handle that is effectively a spring bent into a hyperbolic curve! An endearing combo of cute and geeky. *Squee* The engineer in me found it very appealing and worthy of further examination and appreciation. Seriously, the place is worth checking out. Now, don't all go at once - I think part of its charm is also the fact that it isn't packed and hectic like most other Melbournian brunch spots. It's the kind of place that, on a good day, you could sit at the back, in the sun, amidst the hanging flower pots, with your favourite book, while you sip your tea/coffee and lazily consume (or devour) your meal of choice.